In 1975 Christopher Mayhew and Michael Adams delivered their powerful indictment of Western media coverage of the Israel-Palestine issue. 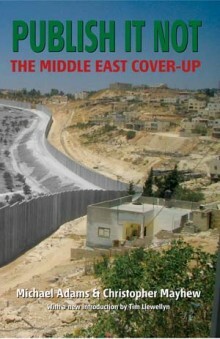 Both men, politician and journalist, had direct experience of the situation in Palestine and both felt passionately that a curtain of concealment and deceit had been drawn over media discussion of the Israeli colonization of Palestine, resulting in misinformed and biased perceptions. The importance of their discussion of the Zionist management of the British media in Publish it Not cannot be overstated. It was pivotal in the process that has unmasked a number of myths: that Zionist intentions in Palestine were benign and not a project to displace the indigenous population of Palestine. that Palestine was ‘a land without people’ and Jewry ‘a people without a land’ before Israeli colonization; that Zionist endeavour ‘made the desert bloom’. that 600,000 Jews opposed 40 million Muslims in 1947-9, that Israel has always sought, and its Arab neighbours have rejected, peaceful relations. Thirty years on, a new edition of this classic exposé reveals that little has changed in media treatment of the Palestine issue. An extensive introduction by former BBC correspondent Tim Llewellyn describes developments since 1975 and compares the issues that Mayhew and Adams addressed with those existing now. Christopher Mayhew (1915-1997) was a Labour MP and Minister before joining the Liberal Party in 1966. He was the author of several books and plays. Michael Adams (1920-2005) was a journalist and film-maker who was instrumental in setting up the Council for the Advancement of Arab-British Understanding in 1967.